Rotating sprinkler activated solely by the force of the water, ready for immediate use, it covers a wide circular area with a uniform, targeted spray thanks to the swivelling nozzles. 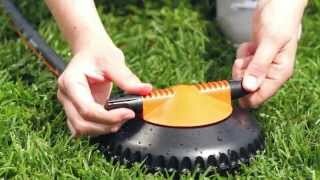 Made in sturdy ABS, you can easily drag it to wherever it is needed without damaging the grass. In addition to watering, it creates pleasant decorative water games. Rotating 2-arm sprinkler constructed entirely in ABS. Special rounded design enables easy movement over lawn. Adjustable nozzles optimise performance also at low pressure. Covers circular areas with light rain effect. Pieces per pack: 4 pcs. Pieces per pallet: 180 pcs.